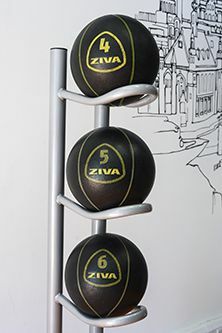 Medicine balls are a fitness tool that is used to add resistance (additional body weight) to traditional lifting exercises, they are not meant to withstand impact. They come in various sizes and can be used to perform various rotational movements and exercises such as push-ups, Russian twists, squats and throws. The CitySport name and associated trademark are copyright City, University of London. CitySport is a sports and fitness facility in Clerkenwell (EC1), providing excellent health and leisure facilities to our students and the public.